Fair Trade People Tree Clothing is pioneering environmentally sustainable fashion; partnering with Fair Trade artisans and farmers in the developing world to produce a collection of ethical and eco fashion. Not only is their clothing ethically made using sustainable methods to stand up against exploitation their garments are hand crafted in organic cotton and sustainable materials, using traditional skills that support rural communities. Their clothing range is gorgeous and they design and produce high quality, fashionable products through collaboration with leading designers to produce unique collections. People Tree are helping to alleviate poverty in the world’s most marginalised communities. People tree use cotton that is certified organic and Fair trade, all our clothes are dyed using safe and natural dyes and source many products locally, choosing natural and recycled products over toxic, synthetic and non-biodegradable materials. They also ship their products by sea instead of air and weave fabric by hand, reducing our impact on global warming! 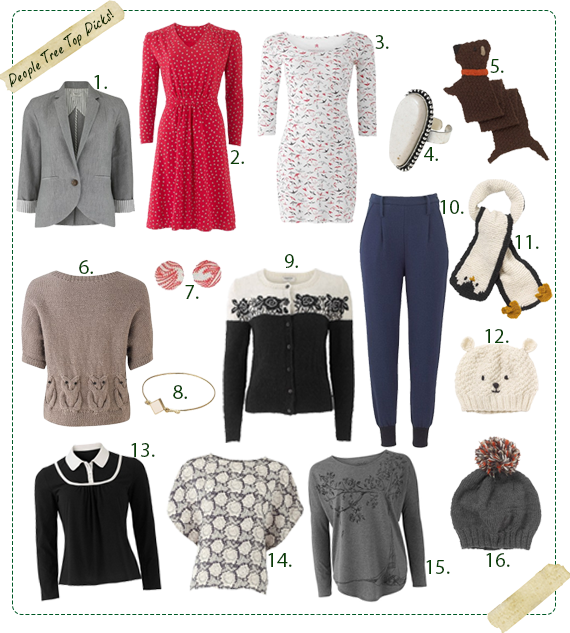 I love their products, especially knowing the background of the garment, my favourite being number 6 – owl two way cardigan that can be worn with owls at the front of as a cardigan. Previous Post Christmas Characters nail art!